As my regular readers know, my dad inspired me to start Sunny Day Family. He passed away in March 2014 and I feel his absence every day. 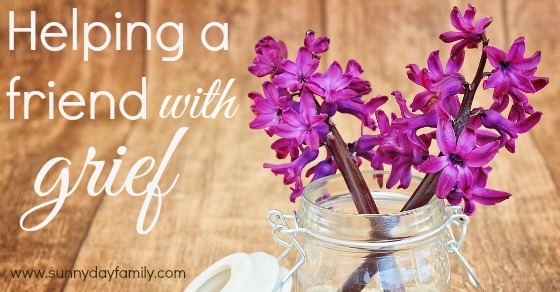 My friend Evelyne of Nemcsok Farms has written a lovely piece on how to help a grieving friend that she has given me to share with you. Even if you have never lost someone very close to you, such as an immediate family member, chances are you might know someone who has. I have heard it said, and actually have felt the same way – that when your friend loses someone, you just don’t know what to say. You just don’t know the right thing to say. Let me tell you, there is no right thing to say. And yep – there are a ton of wrong things to say. So what do you do? Yes, most definitely. Via message, text, email, phone call, whatever you use as your regular method of communication, stick with it. However, a phone call to offer condolences is always ok. Nobody is going to be offended by a phone call, offering kind thoughts and simple messages. Yes please. Say “I’m sorry for your loss”, and leave it up to your friend to expand if they want to talk further. Be prepared for nonsensical ramblings, and bursts of information. Grief comes in waves. Big, hard, raw waves that crash at your bones and your spirit. Thoughts and ideas that come as a result may feel exactly the same way. This is not transferable. If you’ve never been there, you may not have any idea at all what it is like. Undoubtedly. It need not be expensive. A bouquet of wild flowers picked from the side of the road packs a big punch. A $1.00 single cut flower is as sweet as a $50 arrangement. It will still brighten someone’s day, and really, it is all about showing your friend that you care. NO. Just help. Actions speak way louder than words. 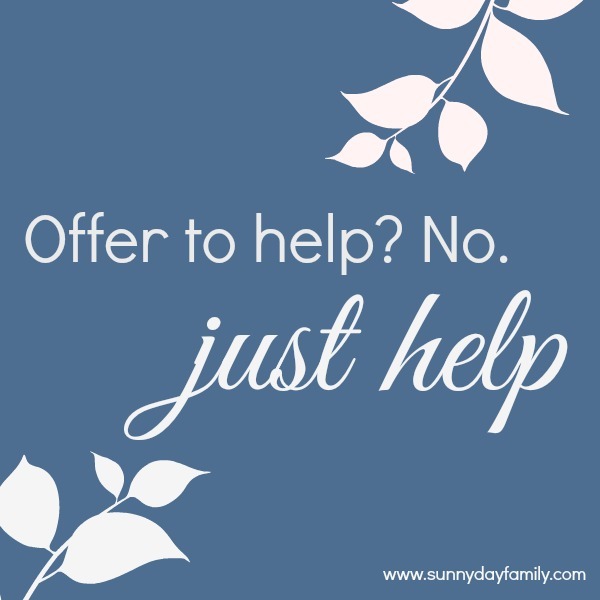 It is very easy for us to say “if you need anything, just ask”. Obviously your friend needs help. To illustrate this further, I like to use this analogy – if you come across a person entering a building and they are carrying bags and boxes in their arms, and they can’t possibly open the door, do you open the door for them, or do you actually wait for them to ask you to get the door? The answer is pretty simple. Be it a phone call, a prepared meal, a short visit, a warm coffee delivered to them at work, or at home – just do it. Just do something nice and thoughtful in whatever capacity you have to do so. No. As long as what you have to say isn’t completely and totally ignorant, say it. Trust me, your friend understands. Your friend would rather you make a social blunder in an effort to show you care, instead of coming to the painful realization that nobody cares. Your friend knows it is an awkward situation. Remember, it is awkward for them too, and painful. Do whatever you can – your friend will appreciate it, and you’ll feel pretty good for it too. Another dear friend of mine, Stefanie of Simple Acres Blog, has written about her journey with infant loss. If you're coping with a similar loss (or helping a friend who is), please take a moment to read her words on maintaining hope in the darkest times. Evelyne is the owner and author of Nemcsok Farms. Read her blog and follow her on Facebook, Twitter, and Pinterest. I am fortunate to have some wonderful friends. Often a kind friend makes all the difference! That is so true! And kindness can be so simple. Thanks for letting me share your words. Wonderful post! I am one that is not good with words, and when it comes to a loss one I just don't know what to say or do. Thanks for sharing this post. Thank you. I think everyone struggles with what to say, and I love Evelyne's suggestions. 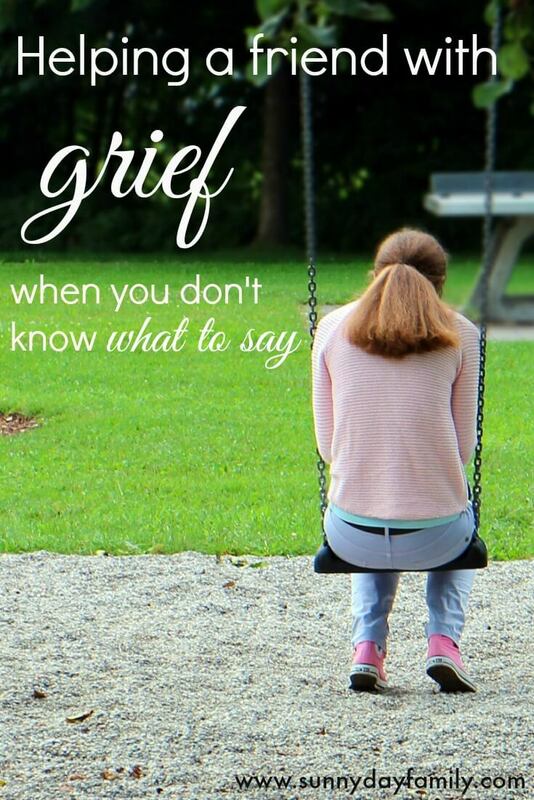 When my baby grandson died suddenly, my daughter was torn apart, Sometimes you just have to be there to pick up the pieces once the storm is over. Me? I built a garden..what else could a horticulturist do? Thanks for your lovely post, Evelyne. I am so sorry for your loss. A garden is such a lovely tribute. Great advice. So sorry about your dad, Laura. We lost my 3 year old nephew to cancer in 2013 so I understand the ups and downs of grief. Or maybe I don't. I'm sure you know what I mean. Thank you. I am sorry for your loss as well and I know exactly what you mean. This is such a great post. It is so hard to lose someone close to you, and just as hard when someone close to you loses someone they love. This article provides some great tips on how to handle it gracefully. Very good post. When my son passed away, hugs were the very best. My mom says hugs are the best too. What wonderful suggestions. It is always hard to know what to say and can be awkward. I lost my two year old daughter many years ago. It always made me feel comforted and loved when someone acknowledged my loss. Thanks for sharing on sundaysmallvictorieslinkup! Such sweet suggestions when those close to you are going through hard times. Kindness and love will help get them through.